The two legendary actors who brought Don Corleone to life are finally united. A modern heist movie, The Score is reasonably satisfying but decidedly unspectacular. Nick (Robert De Niro) is an expert thief who can break into any building and open any safe to steal the best protected jewels. The elderly Max (Marlon Brando, in his final completed movie) is Nick's handler, arranging jobs and buyers for the stolen goods. Nick lives in Montreal where he also owns a jazz club, but he refuses pull any jobs in the city, for fear of attracting attention in his home town. Diane (Angela Bassett) is his lover and very much aware of his secret life as a thief. Nick considers settling down with her to a life of normalcy. When their most recent job turns sour due to the unexpected death of a buyer, Max convinces Nick to consider a daring high-risk, high-reward break-in of the Montreal Customs House to steal a precious jewel-encrusted sceptor. Max connects Nick with Jack (Edward Norton), an aggressive thief who has secured a job at the Customs House, pretending to be a dim-witted overnight janitorial assistant. 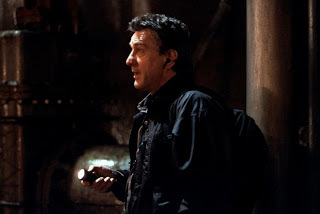 With Jack as the inside man, Nick starts to plan the heist, hoping that this could be his last job before retiring for good from the dangerous world of burglary. The Score creaks noticeably at the edges. Marlon Brando's character of Max is provided with a vague backstory of financial hardship imposed by an invisible foe and then dropped altogether. It may be extreme to call Brando's entire appearance in the movie a publicity stunt, but his character is, at best, underdeveloped and abandoned. Angela Bassett's role as Diane is also wafer thin. Her relationship with Nick is created for the sole purpose of providing him with a reason to consider quitting the criminal lifestyle, but Diane herself remains little more than a mirage, a blurry vision of the ideal woman with no details drawn in. While character depth is not a strong point in The Score, De Niro and Norton do well to bring Nick and Jack to life, and ensure that the core of the film pulses with healthy tension. 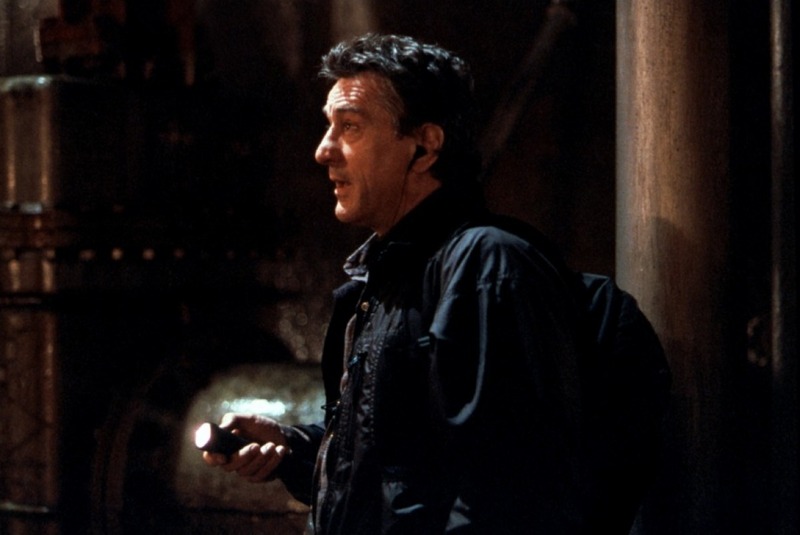 De Niro skates expertly through the movie with fluid ease, his face providing Nick with the background that the script neglects. Nick is too good at what he does to resist the next big job, yet wise enough to know that one more job may not be the best thing for him. The opening scene of a theft interrupted leaves little doubt that Nick can untangle himself from any mess that he finds himself in, and it is only Jack's unknown and erratic attributes, rather than his self-proclaimed bravado, that presents a challenge. Norton gets the showiest role, as the self-confident Jack and pretend-retard janitor Brian. Norton is an effective counterweight to De Niro, but is less capable of filling the missing background story. 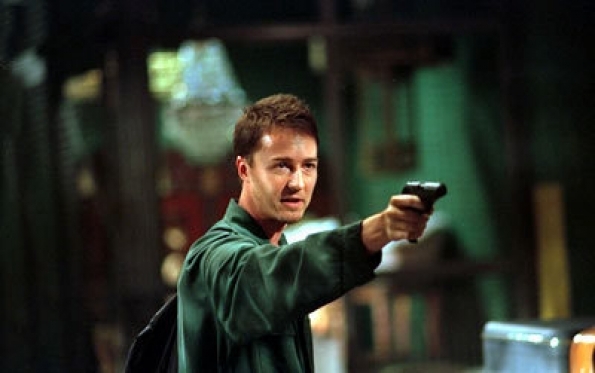 The trio of screenwriters comprised of Scott Marshall Smith, Daniel E. Taylor, and Kario Salem conjure up no information about how Jack came to be who and where he is, and while obviously talented and ambitious, it is unclear whether or not the planned Customs House heist is even Jack's first job. Director Frank Oz does well with the robbery scenes, where dialogue and character are less important, and stealth, smarts, and a battle between thief and technology take over. Both the unexpectedly tension-filled opening scene and the climactic attempt to steal the sceptor proceed with well-oiled precision. But the flustered ending lets the film down again, with the script abandoning Max's story and most egregiously overlooking the potential for a simple plea bargain to land Nick, Max and Jack in a lot of trouble. The Score takes a solid shot, but does not strike the target cleanly.